I want a backdrop with an image on it – but I don’t have the image. What are my options? Often we meet clients who have a vision for a backdrop image – but they don’t physically have the image itself as a digital file. Unlike a painted backdrop – where a sketch and some artistic licence leaves the finished product in the hands of your artist – today’s “wide format digital printing” methods are a different approach to customized backdrops and require some high-tech image delivery methods. Some benefits of digital printing include short turnaround times, photo finish quality, the ability to regenerate a backdrop with “exactly” the art or design you had hoped for – and simple and accurate replication of logos and branding in a large scale. The downside however is that you get “out” of the printer” what you put “in” to the printer. In other words – the quality of the printed output is directly in relation to the quality and resolution of the file that you provide to us at the time you order your digitally printed backdrop. Here are some tips and tricks when providing – or building – your digital printing file. Whenever possible provide a file that is a vector based file. Vector art can be scaled endlessly – therefore a vector file will always look clean and crisp even when enlarged to grand format sizing. You may hear it called “line art” or “vector art” – most professional graphic designers will be able to produce vector art for you, especially if your file is a logo. If you are buying photos or images to reproduce, check first that the file size will be adequate. Ideally we like to print at around 72 dpi MINIMUM when we print a backdrop – so that means that when the art is scaled smaller in dimensions for delivery, the dpi must be exponentially higher…. so that when enlarged to full size the file is at a minimum of 72 dpi. Try to avoid at all costs “up-ressing” your art files or “unnaturally forcing” dots per inch into the file. Some programs such as Photoshop allow you to take a low res image and then tell it to “have more dots per inch”. The problem is that the file then becomes muddy and blurry – it’s really not ideal and won’t lead to a great output. Try to start with a file that is the right size. When building art (for ANY of your promotional materials), ask your graphic artist to create the logos in a way that they will be scale-able for many different uses – for example if you create your CD cover art as vector art – then you would be able to print the file as a backdrop, too! BUT if you build your CD art to scale at 6″ x 6″ (the size of the CD Cover) and if you build it as a flattened jpeg – then no matter how hard you try, you will never be able to print a good looking backdrop from the file. If you want it done professionally – and your artist isn’t familiar with wide format printing requirements – then consider contracting directly with one of our preferred graphic artists. Sometimes it is just easier and faster to go straight to the right resource! There’s plenty more to it – and many more details on our website, on our Digital Printing page, as well as on the pdf version of our File Preparation Guidelines. This is just a little starter tips and tricks for you to get the conversation rolling – let us know how we can help! If you want some inspiration then check out our Digital Printing Portfolio………..if you can dream it, we can print it! LARGER THAN LIFE BACKDROPS by Sew What? Inc.
Why Won’t You Buy Back My Used Stage Drapes? This is in fact a question that we are frequently asked, and the answer isn’t always one that the client was hoping for. The short answer is – “$0.00 – We won’t buy them back”. Unfortunately, our loss advisors and insurance company have for years now recommended against purchasing used drapery back from clients, irrelevant of the condition that they are in. Fabrics in public spaces need to meet national flammability test standards……….. One must consider that flame certifications have “expirations” on many fabrics, and also because storage and use conditions are out of our control – they are in fact a liability/risk more than a benefit for us. We can’t just “resell them” without going through testing and possibly retreating the items – at which point a future client is honestly better off with a fresh new and clean product. In this wasteful world, it seems such a disappointment to just throw out these expensive and often still useable items – but do consider this – if you give them to your child’s school or a local non-profit theatre, and they have a fire, you may end up liable. Many years ago, Sew What? Inc tried to design a model for a nonprofit organization to put used concert fabrics and draperies back into the market by donating into low income areas and venues without resources – but just could not get it to be something that could be covered in terms of insurance. We agree – it IS a crying shame. So wasteful. So when purchasing custom drapery, it is best not to look at it as having a “buy back” value – certainly you will likely end up disappointed if you approach it from a “what I can get for it after the tour” mindset. Well – firstly if there is a fire – we are all going to be implicated – and secondly as the rightful owner and previous user and the SELLER of the item, the liability stands in the hands of the client selling the goods. As for the length of time something is flame retardant – Honestly there is no stock answer for FR certs. You see a cert simply states that it passes at the time it is sold and WILL CONTINUE TO DO SO assuming it is used in conforming ways that don’t impact the textile. Oil based fog juice – dust – pyro overspray – hairspray – paint –cleaning chemicals – all degrade the fabric’s ability to pass subsequent FR testing. On a tour really it is a crap shoot. Unless you are prepared to pay to have the drapes tested (and possibly retreated) and then sell them with new current FR certificates, it really is a risk. I have seen 15 and 21oz Encore pass when re-tested after several years. I have also seen fabrics fail after a week of being on stage with pyro. Honestly – it’s a shame to say it – but I would encourage any client to be cautious – the few hundred bucks that the band gets for the used drapes by selling them now won’t even begin to pay for the problems if there is a fire or a complaint about them down the line from the person who bought them or was gifted them without a clear understanding of the FR liabilities. And that’s not to mention the bad publicity. No band or entity needs to be the bad guy after having tried to be the good guy………. It’s just not worth it. Consider UPCYCLING – why not contract to have your old backdrops, stage drapes and tent walls sewn into collectible PURSES / TOTES and REUSEABLE GROCERY BAGS? So – you spend a little money to convert the textiles into saleable and collectible items – and then you can resell them as memorabilia merchandise on future tours! This is a way cooler (and safer) approach – and while there is some cost to have the articles converted, you then get to sell them or give them to fans or friends – possibly make some money and not have the risk………. With springtime right around the corner, we are seeing an influx of production designers for dance performances and competitions utilizing our amazing digital printing abilities to create the most fabulous backdrops and banners for their shows and events. One option is to use a digitally printed scenic backdrop to serve as scenery behind the dancers. Another option is a step and repeat backdrop to be used before or after the show, or during a dance competition. By adding the competition and recital’s logos and other branding elements, and even the names of judges or special guests, they are able to create an effective and easy way for the crowd to notice and remember the show long after the event ends. And with an extensive range of fabrics that can now be printed onto, we can construct something that meets the needs of nearly every dance company and competition. 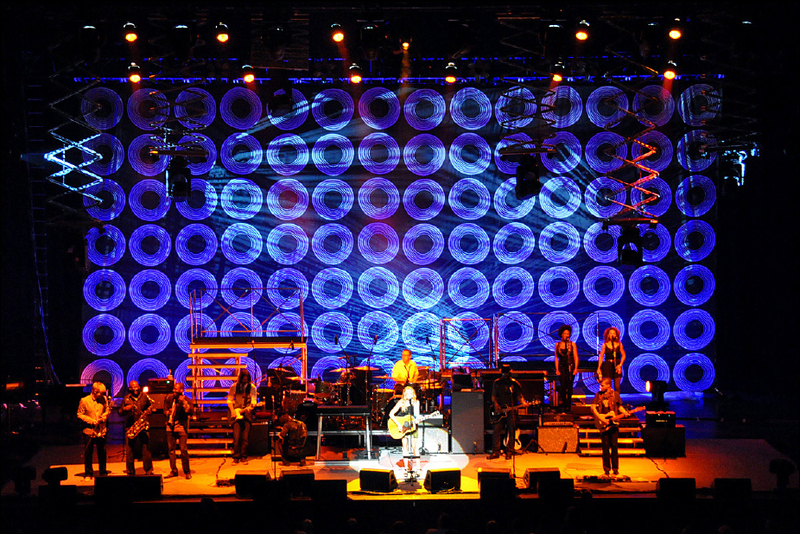 Though this digitally printed scenic backdrop is shown at a Sheryl Crow concert, a similar look would work well for a dance performance. In addition to digitally printed scenic backdrops, specialty drapes are available to compliment a digital backdrop. With a wide variety of specialty rental drapes available, dance companies have more options than ever before to help make their recitals, productions, and competitions even more sensational than they thought possible. Using everything from Mylar Rain Curtains, Stardop LED drapes, Metal Mesh backdrops, and Pewter or Silver Textura legs and swags, dance competitions can now design a look that fits their own unique style and motif. Adding a dramatic “stage reveal” with the simple push of a button with one of our easy-to-install and affordable Kabuki systems is another fantastic way to dazzle their audiences like never before. One of the best parts of this industry is getting to be a part of some incredible events, including music concert tours, special events, plays, trade shows, church productions, and of course, comedian tours, too! We here at Sew What? / Rent What? Inc. have a large warehouse in the Greater Los Angeles Area that has room for vehicles of all shapes and sizes to be able to comfortably and easily pull up and get the rentals and purchases that they need. With the help of our experienced warehouse crew and a very accommodating location, we are able to manage trucks of all lengths, taking some of the stress out of what can sometimes be a very complicated cross-country endeavor, often involving multiple vendors and some tricky pick up locations. 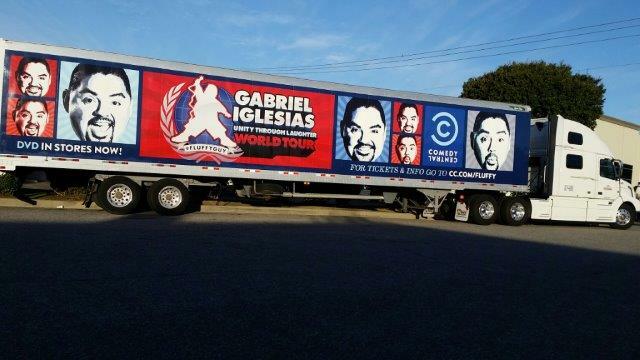 Recently we had one of our favorite clients Icon Entertainment come through town to pick up some rented and purchased stage drapes for Gabriel Iglesias’ impressive multi-city world tour. Seeing this big, colorful truck waiting at our docks bright and early one morning was a fantastic way for us to start our day! Knowing we helped make the driver’s workload a little easier by having plenty of room to move his truck in and out, and having our amazing warehouse staff help get it all loaded safely with our forklift, helped us feel really good, too. Being able to accommodate rental and purchase orders of all sizes and varieties, as well as the trucks that need to come and transport them to and from their shows, is something that we truly pride ourselves on! Interestingly – of course when I look at it logically it is much like the commitment to eat less – exercise more – go hiking – stop speeding. It’s a yearlong day by day commitment to improvement – both self and business – and a commitment to slow and steady change. Rome was not built in a day – the business will not double in size miraculously due to a big tour season – nor will new products develop on their own or process improvements fall into place without some grease and muscle applied. So – this year – I am going to give it my best shot to tell the jitters to step aside – and just try to look at the year in a “year-round” kind of way. 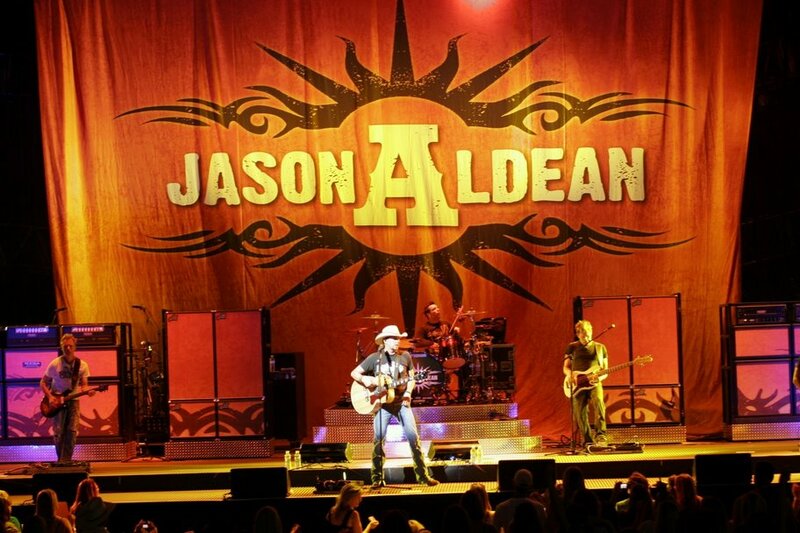 Tour season is welcome to attack at any moment – and can hang around as long as it likes!!!! And don’t forget – it’s an open door here and WE LOVE VISITORS – so don’t hesitate to stop by some time and visit with us all – and while you are here you can see if we are keeping our commitment to long term slow and steady improvement!…………. I will get the blender fired up – a good margarita always helps keep the calm………..